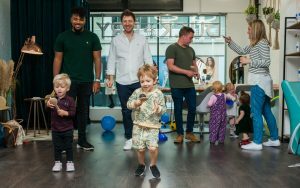 This September we have seen some brilliant and exciting campaigns emerge, including our big Daddy Day Care event for Mustela and the launch of EverActive C&E for AlumierMD. We worked to create a morning of relaxation at Duck and Dry for Dads and parents, which was also a fun, creative morning for the kids. As many of Mustela’s products are formulated using their patented ingredient Avocado Perseose, we had an avocado and spoon race, kicking off the sports day in style! While the kids were racing the Dads were having ‘Daddy-Do’s’ and relaxing, learning all about Mustela’s products and why they are the best for babies’ and children’s skin. As well as having a great time we gathered some brilliant feedback, and kicked off our #DiscoverMustela campaign, hosted across all the brand’s social media channels. This month saw the embargo lifted in AlumierMD’s biggest new launch, EverActive C&E. In July we hosted a dinner at 19 Greek Street with trade and consumer press, and influencers, explaining the power of the ground-breaking new Vitamin C & E serum. With over four years R&D this product is cutting edge in tackling the oxidation challenges when harnessing antioxidant and peptide power in skincare, allowing for a potency that actively promotes collagen synthesis. Vitamin C serums should be clear to straw coloured for optimal effectiveness. When exposed to air or light, the Vitamin C oxidises, causing many serums turn an orange or brownish colour. Once the Vitamin C has oxidised it is no longer beneficial for the skin. EverActive C&E stays fresh because you only mix the Vitamin C into the serum when you’re ready to use it; keeping it fresher and more potent for longer. Before the end of September we have already gathered shining reviews from press [such as ‘My skin has really got it’s oomph back!’ – Sam Freedman, ‘Brightening and glowy-fying’ – Alessandra Steinherr], and seen print coverage published in Grazia. And to top off a busy September our leading KOLs in the Beauty and Aesthetics fields have been filling pages with commentary and case studies, making firm their positions as leaders in their industries. Paul Edmonds has appeared on Byrdie and Refinery29, Dermalux treatments on HELLO! Online and Sheerluxe, Kate Kerr London featured commentary and adevice on Refinery29 three times, ZO Skin Health on Glamour Online three times, Baldan Group in the Sunday Mirror, HydraFacial treatments in the Telegraph Magazine, and Dr Sarah Shah in the Sunday Mail and Get the Gloss – and more! We believe that reinforcing what really matters to a consumer is what makes a difference; why people should buy something and why people should make it part of their lives. We will raise the consumer and trade profile of your brand, and help your customers understand not only what you do, but more importantly why you do it. We love building trust, loyalty, brand preference and desire, helping to grow your audience, your market share and your sales.